To the mixture of planes, trains and automobiles, I added a generous dollop of motors cooters. All roads to Asia from Alaska lead to the West Coast. Cathay Pacific, an Alaska Air mileage partner, blocked 14:40 for the flight from San Francisco on a Boeing 777-300. But for planning purposes, I had to remember that I was losing an entire day en route. I checked in on Wednesday evening and arrived on Friday morning! The return flight featured the all-new A350-1000. This is Airbus’s answer to the high-tech Boeing 787. The A350 is pressurized at a lower altitude than the 777, which makes it easier to breathe. It’s quieter and has bigger windows. Cathay Pacific will offer four flights a week from Seattle to Hong Kong starting Mar. 31 using the A350. The in-flight internet worked very well for $19.95. By the time I arrived in Hong Kong, I didn’t know what time it was or what day it was. I just followed the crowd to the connecting gate for the flight to Ho Chi Minh City. Although Cathay Pacific also offered this flight on a B777, it was a completely different configuration. On the trans-Pacific flight, the front half of the plane is dedicated to lie-flat business-class seats. On the intra-Asia flight to Ho Chi Minh City, there were the more traditional plush seats up front, then 3x3x3 seating in back. It costs 50,000 Alaska Air miles for a one-way business class ticket. That includes first class passage on Alaska Air to the gateway city, then business class to your destination. With your lie-flat seat, you also get access to Cathay Pacific’s lounges in San Francisco and Hong Kong. There’s plenty to eat and drink at the self-serve buffet. There’s an introductory fare from Seattle to Hong Kong in April and May for $571 round trip, in coach. On arrival in Ho Chi Minh City, my contact advised me to get some local currency (Vietnamese dong) at the ATM and purchase my taxi fare from the desk at the airport. Even though the airport is less than 10 miles from the city center, it took about 30 minutes to navigate the traffic. Next time, I’ll just use the “Grab” app to hail a motorbike. After seeing what the locals put on top of the bikes, my medium-sized duffel is no problem! Back in Anchorage, I tried hard to navigate the Vietnam Railways website to purchase a ticket, without success. My guide, Sam, said not to worry. Since it was low season, there were plenty of seats available. After lunch, we headed over to the station and reviewed the selection. There are hard or soft seats and hard or soft sleeping berths. I opted for the softest sleeping berth I could find. 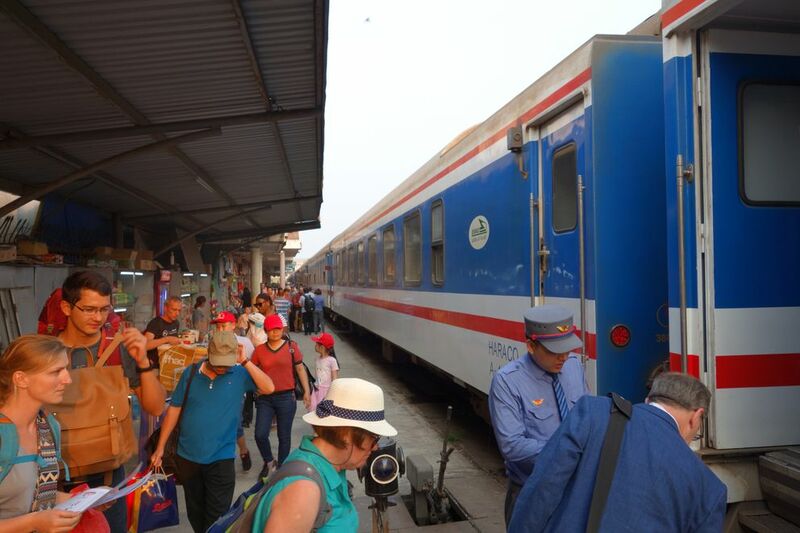 The one-way ticket for the 19-hour train ride from Saigon to Hue was $71. Unlike the Alaska Railroad, there is no dining car or bar car. You can bring your own food on board and there are vendors that go up and down the aisle from time to time. Most of the offerings were variations of the “Cup-o-Noodles” theme. In each car there was a tap with hot water so you could top it off, stir and enjoy. The bunk was comfortable enough, but it was just a little short for my 6-foot-4 frame. Still, there were reading lights and USB plugs, in addition to power outlets under the small table between the two berths. Other cabins had four or six berths. You would be wise to select the lower berths, unless you’re a gymnast. I’m not exactly sure how you get up and down in the night. Pro tip: bring your own toilet paper. The scenery on the train ride was beautiful. The tracks hug the coast, so I saw lots of rice fields to the west and beaches to the east. On arrival in Hue, I learned this city was the capital of Vietnam from 1802 to 1945. It’s still a seat of learning with more than a dozen colleges. Also, it’s a spiritual hub, with many temples, pagodas and monasteries. My guide, Thanh, picked me up in the morning and I assumed the position: the back seat of his scooter. Hue is much smaller than Ho Chi Minh City, with just 500,000 residents. 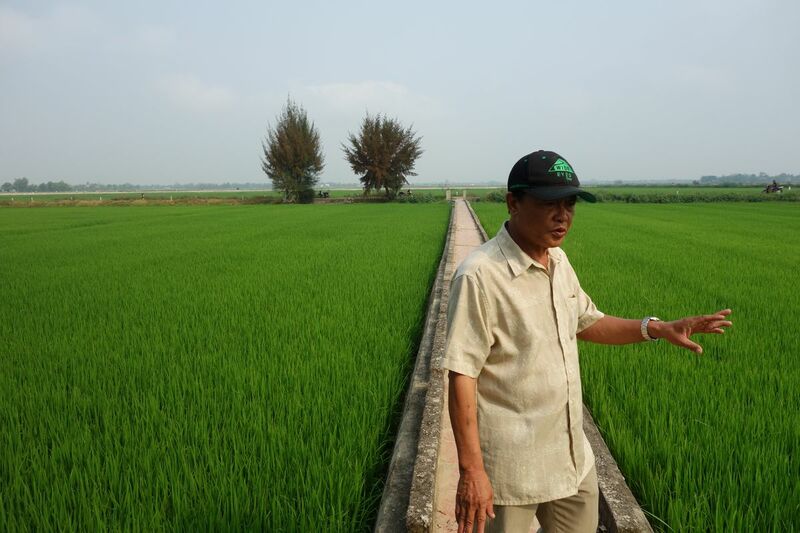 It didn’t take long to get out of town to see the rice paddies and the village markets. Back in the city, the big attraction is the 19th century Citadel, which took 27 years to build after construction started in 1804. It encompasses the Imperial City of the Nguyen Dynasty. The Citadel was burned by French and damaged by the U.S. during the 1968 Tet Offensive. The area was declared a UNESCO World Heritage Site in 1993. Initially, I planned to take the train all the way north to Hanoi. But Vietnam is bigger than it looks on the map — so friends advised me to fly instead. It was just $50 for a one-way ticket on Vietnam Airlines from Hue to Hanoi. The aircraft, an Airbus 321, was clean and comfy. I earned a few Delta miles on the trip, as Vietnam Airlines is part of the SkyTeam Alliance. My scooter guide in Hanoi, Huy, drove me around a couple of the big lakes in downtown Hanoi. One of them has a beautiful temple in the middle. It’s very popular with locals and tourists. 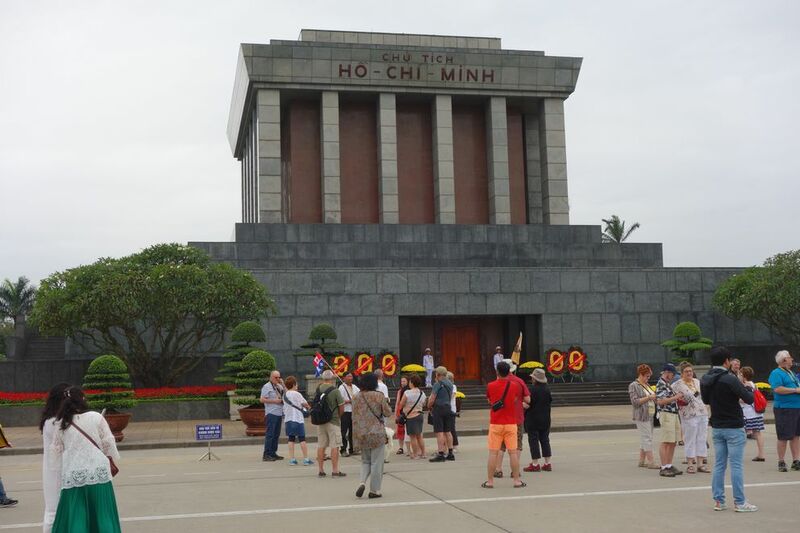 Lots of prime real estate, though, is devoted to the mausoleum of Ho Chi Minh. The giant, granite tomb is 70 feet high and 135 feet wide. It’s built up from the street, with several different levels for parade viewing. The interior of the mausoleum was closed when I was there. Next to the structure itself is the complex of buildings where Ho Chi Minh lived and worked up until his death. His main office was adjacent to a bunker where he went when U.S. planes were dropping bombs. Another garage housed his cars — and his kitchen and living quarters are carefully preserved and on display. On my way back to the airport, I started making a list of places to visit next: Ha Long Bay, featuring overnight cruises, the Mekong Delta cruise and the beautiful beaches around Hoi An. If I never ride on the back of a motor scooter again, I will die happy. But it was the perfect way to see a small piece of Vietnam in a week.